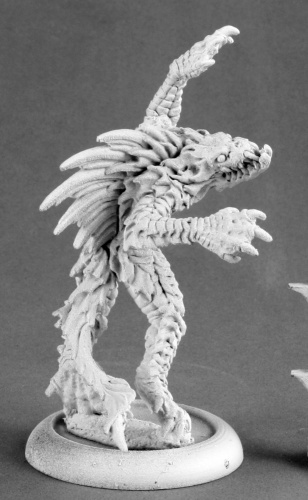 The Nauticans for Warhammer Fantasy Battle: A new Wahammer-ish Sea Creature ! A new Wahammer-ish Sea Creature ! 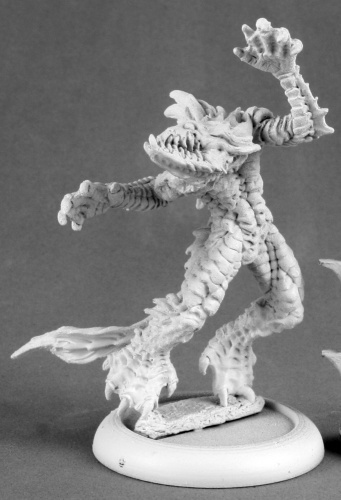 Not very Warhammer-like (in the traditional sense) but I do fancy this new miniature from Reaperminis because it's a true looking ocean dweller - weird and wonderful in a freaky way ! Also, I'll incorporate the new 8th edition special rules. Interceptors for example will just receive the new Devastating Charge rather than their existing special rule. Anyway, this is the new miniature that Riceeman (a valued Battle Reporter forum member) found in the new releases on Reapermini.com. He's just about perfect for my fishy ladz so I'll be ordering one or maybe many (he's fairly cheap so could end up as a small unit - my mind is still awash with it's potential). If you have any ideas if this should be a character or unit and what it's abilities or even name should be then please let me know. I've incorporated quite a few reader suggestions (actually lots of them !) so far. Reapermini have given me permission to use pictures from their site for the purposes of the Nautican Army. Mermoids are deep sea Ocean Dwellers that favor eating the flesh of land dwellers the most. They work the best in groups and are known to sink ships to the bottom of the sea & then call it their home. The Mermoids would fit in as an allied race for the Nauticans, scouting the surface before the Nautican army arrives (since the Mermoids are well known to come up to the surface to eat some land dweller flesh, their favorite). You can work out the stats & the rules, but just so you know, these are aquatic predators, not some noble sea dweller. The profile fits the model nicely Nikola. Good thinking. I still haven't got back down to work on the Nauticans./ First of all, I need to go around all of the forums and collect up the comments and ideas that people have posted since Spring time ! Should be Mermoids be Creatures of the Deep, the Reefs or the Shores? Mermoids are deep sea Ocean Dwellers that favor eating the flesh of land dwellers the most. They work the best in groups and are known to sink ships to the bottom of the sea & then call it their home. The Mermoids are trained by the Nauticans to scout the surface before the main Nautican army arrives. The Mermoids are very savage creatures, tearing their enemies limb by limb with their razor-sharp claws, and they are known to tear a head clean from a Humans torso with just 1 bite of their snapping jaws. These creatures are not some noble sea dwellers, but ferocious creatures that came from the Deeps. The Mermoids are extremely vicious creatures, not even the Expert Nauticans could fully train them without loosing at least 2 limbs & gaining a lot of scars, but the Mermiads on the other hand know the secrets of the Mermoids, and use their enchanting songs to tame these creatures (to an extent). And in battle, the Mermoids are attracted to the Mermaids song, and will not leave her side until theirs (or hers) final breath. If you have a unit of Mermoids & a Mermaid on the battlefield, the Mermaids will be fielded in rank-and-file formation, and the Mermaid will be placed as their leader (in the second rank).